On this date in 1941, less than two months after the Nazis invaded the Soviet Union, they executed the Hassidic Rabbi Ben Zion Halberstam along with his son, Rabbi Moshe Aaron, three of his sons-in-law, and a number of other Jews. Born in Galicia in 1874, Ben Zion was the son of Grand Rabbi Shlomo Halberstam in the village of Bobov. After the father’s death in 1905, the Chassidim elected the son Grand Rabbi in his place. During World War I, the Bobever Rebbe fled to Austria, but he returned to Poland once hostilities ceased and founded a highly regarded yeshiva. During the mid-thirties he lived in the town of Trzebinia in south central Poland, and developed a following of thousands of disciples. He was a farsighted man and in 1938, when Germany expelled its Polish-Jewish minority, he wrote an open letter to the Jews of Poland explaining the terrible situation and asking them to help their displaced brethren. After the Nazis invaded Poland, Haberstam fled to Lvov,* which was under Soviet control and relatively safer. He hid there in a disciple’s house, and his followers tried and failed to get him papers to travel to the United States. In June 1941, Nazi Germany invaded the Soviet Union. By June 30 they’d reached Lvov, and by July 25, Rabbi Halberstam and several other members of his family were placed under arrest and marched to the Gestapo prison. Rabbi Ben Zion [he was 67 years old by then] was weak, and could not keep up with the fast pace of the march. When he fell to the back of the column, the policemen whipped him and shouted at him to move faster. The march continued until the prisoners arrived at the Gestapo headquarters. Rabbi Ben Zion’s family tried everything to win their release, but after three days, he was executed at the Yanover forest together with his son, three sons-in-law and the other prisoners. Although the Halberstam family suffered significant losses during the Holocaust, at least one of Ben Zion’s sons survived, and so their dynasty did not die out. There exists today a community of Bobover Hassidim in Borough Park, Brooklyn. 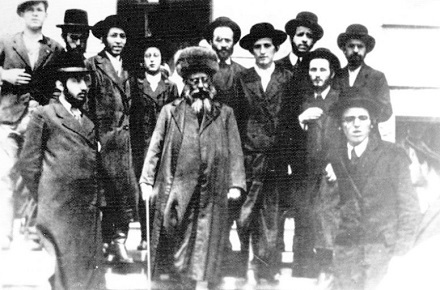 Rabbi Ben Zion Halberstam in the center, pictured during his time in Trzebinia. The bare-faced youth directly over the rabbi’s shoulder is Moshe Aaron Halberstam, the son who would eventually be shot at the rabbi’s side. * Called Lviv in Ukrainian, Lvov in Russian, Lwow in Polish and Lemberg in German; the city is at the heart of Galicia, and has changed hands repeatedly between these countries. Right now it’s Lviv. ** Although the smaller Auschwitz I camp for political prisoners existed from 1940, Auschwitz II-Birkenau, the Reich’s metonymical extermination facility, was constructed towards the end of 1941.